The delicious Ekyrenal+ is a superb complementary feed from Audevard Laboratories. Formulated to provide horses with the nutritional support they need after exercise, this apricot flavoured feed contains specific nutrients, specially selected plants, as well as choline and methionine. Nutritional support is necessary during recovery periods to help horses build up their energy following the production of large amounts of organic waste after exercise. 1 Litre Bottle - Sufficient for up to 40 days' use in adult horses. 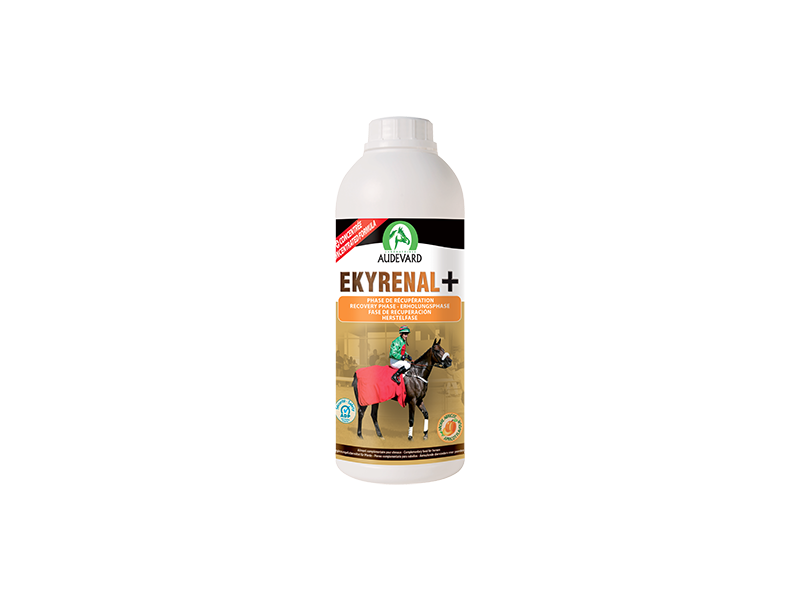 25 ml EKYRENAL+ once to twice per day, according to the horse’s requirements. Shake well before use. thistle (Silybum marianum - extract with 80 % silymarin) 23,100 mg, stevia extract CoE552 1500 mg. 3a- VVitamins, provitamins and substances with analogous effect : 3a890 choline 12,000 mg, vitamin B1 3300 mg Amino acids and salts, and similar products : 3c307 methionine 10,000 mg Technology : apricot avour 5070 mg.; Analytical components : Humidity 88.6 %, crude proteins 1.8 %, raw fats 0 %, crude ash 0.2 %, crude bre 0 %, sodium 0 %. There are currently no questions for Ekyrenal + - be the first to ask one!